I'm so pleased to have a chance to interview Frances Watts, Australian author of The Song of the Winns trilogy! In the series’ first book, The Song of the Winns: Secret of the Ginger Mice, four courageous young mice discovered that ginger mice like themselves are descendants from the country of Gerander. 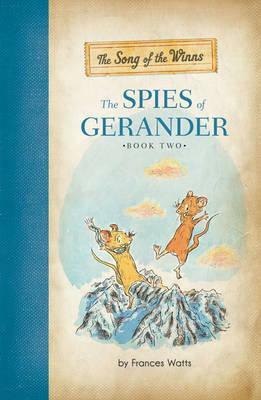 Their country was conquered long ago by the neighboring land of Souris, and now all ginger mice face the threat of imprisonment by the Sourian government to prevent a possible Gerandan uprising. Share a little about how you ended up as a writer - and specifically a middle grade writer, since I know you also write picture books. Being a voracious reader definitely inspired me to write; I’ve always loved language and stories, and I started writing stories around the time I learned to read. That’s not to say that I always knew I wanted to be a writer…Before I was a published writer I was (and still am) an editor. I’ve just always wanted to work with books. Although my working life has been so entwined with books and writing, I never dreamed of becoming a writer myself—until I had that light-bulb moment and the idea for my first book popped into my head. That book was a picture book called Kisses for Daddy, and the idea was inspired by a scene I witnessed between a father and son up at my local shops. I wonder sometimes what would have happened if I hadn’t walked past that father and son that day. Would I have become a writer? I wasn’t looking for a story; the story found me. But once I began to write, a whole new world of possibilities, of stories, opened up. And now I can’t imagine what my life would be like without writing. So I started out writing picture books, but I found that the more I wrote, the more ideas I had, and those ideas kept getting bigger, until I was writing junior fiction and then, ultimately, middle-grade fiction. It felt like a natural progression for me; that these were the stories I had been working up to. One evening I was watching a news story about a country attacking a less powerful one and I started wondering how kids would understand an event like this. When I was a kid I used to read a lot of books set during wartime. Of course the settings made them dramatic and compelling, but they were very character-driven too—and the questions they posed, the demands they made of their characters, had an urgency and immediacy that spoke to me then and still speaks to me today; questions about justice and integrity and personal responsibility. But while these issues are very much part of the Song of the Winns series, I didn’t want them to overwhelm the stories. More than anything, I wanted to write page-turning adventure stories, fast-paced and full of intrigue, funny and moving, with characters that readers will care about. The characters just happen to be mice! I wanted to be able to incorporate ideas about war and injustice in a non-confronting way; using mice gives the reader a bit of distance, while I could still at the same time make them human enough for readers to be able to engage with them. On a practical level, like many writers, I sometimes struggle to carve out enough writing time while still maintaining another career. When you are working on a ‘big’ idea, it can be difficult to maintain momentum and energy. That said, I’m fortunate to have established a freelance career that is both stable and flexible—and very rewarding in its own right. And, of course—again, like many other writers—I have bad writing days, when ideas aren’t working, when the writing seems laboured, when I question my ability…For me this was magnified by the fact that I was writing in a new genre, and that meant I had a lot to learn. But the pleasures, too, were magnified; I really became engrossed in the world and characters I had created. I know I’m far from the first person to say Bridge to Terabithia affected me deeply as a young reader. And my love of Winnie the Pooh and The Wind in the Willows probably explains why I am drawn to animal characters. But if we’re talking about the kinds of books I read for pleasure these days, there’s a lot of contemporary fiction on my bedside table. Recent favourites include Barbara Kingsolver’s Flight Behaviour, Kate Atkinson’s Life After Life, Hilary Mantel’s Wolf Hall and Bring Up the Bodies, and anything by Ann Patchett. I like the classics, too. Jane Austen and Anthony Trollope are two writers I return to again and again for characterisation and brilliant storytelling. Frances, thank you so much for telling us about your writing process and how the stories evolved! Have you seen author Susanna Leonard Hill’s Wednesday feature, Would You Read It? You can help other writers with their story pitches, and maybe even submit one of your own to get a sense of how well it’s working. This week, it’s my turn with a picture book pitch that I’d love some feedback on, if you have a chance. awesome interview!! i really want to read this! Yes, me too, Joanne. Though like you, I'm still unpublished. I stopped writing picture books for a few years to concentrate on middle grade, but I recently started up again and now I'm doing both.